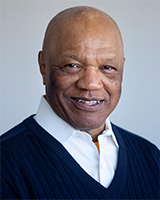 Prof. Earl Caldwell is a nationally renowned journalist who has witnessed and chronicled some of the most important civil rights events of the past 40 years and was the only reporter present when Martin Luther King Jr. was assassinated. As a writer-in-residence, Prof. Caldwell is writing "The Caldwell Journals," a serialized account of the black journalist movement spawned by the 1960s civil rights movement. He previously served as the Scripps Howard Endowed Chair for the Scripps Howard School of Journalism and Communications. Having started his career at The Progress in Clearfield, Pennsylvania., Prof. Caldwell went on to work for the Intelligencer-Journal in Lancaster, Pennsylvania; the Democrat and The Chronicle in Rochester, New York. In addition to his work at The New York Times, he also worked for The New York Daily News. In addition to teaching, he has organized efforts to videotape/audiotape African-American journalists selected for an oral history collection. Prof. Caldwell rose to fame while a reporter at The New York Times when he refused to disclose information to the FBI and the Nixon Administration involving his sources in the Black Panther party. The case, United States v. Caldwell, reached the U.S. Supreme Court in 1972 when the court ruled against him. The "Caldwell Case" led to the enactment of shield laws in many states that allow reporters to protect sources and information. Prof. Caldwell teaches a course on civil rights and the media.